For years, one of the best customer relationship management and scheduling apps for Mac OS X and iOS has been Marketcircle's Daylite. It's a cross-platform tool that, until now, has relied on a server to handle all of the data that can be generated by a single user or workgroup. With the new Daylite 6 introduced yesterday, the need to set up and run Daylite Server on a Mac is now an option, as Marketcircle has also introduced Daylite Cloud -- a service hosted by the company to lower the barriers to entry for users who just want to use the app and not worry about the server infrastructure. Marketcircle basically had to start from scratch on Daylite Cloud, as its Daylite Server architecture topped out at about one hundred users. Fortunately, the company had created Billings for the Cloud, which gave them a framework to work with that not only scaled well, but was cost-effective and fast at syncing. Daylite Cloud lets users work offline on Mac, iPhone, or iPad, syncing changes when a network connection is available. To set up the service, users need only download the app and create an account, and they're ready to go. There's no longer a need to buy a Mac to set up as a Daylite Server (or run it in background on an existing Mac). As teams grow, the account manager can add new users with a click, and an invitation is emailed to the new member to walk them through the process. Finally, since Marketcircle is managing all of the data in a central repository, it's possible that the company will add integrations and services that can't be made with Daylite Server. The Daylite app also received a lot of attention in the update to version 6. The scheduling function now has a calendar year view with a "heat map" that shows really busy days as red, not-so-busy days as yellow, and those rare days with nothing on the schedule as white. There's now a mini calendar in the Daylite Sidebar, making it easier to figure out what's happening on a particular date without having to jump out of another function to look at the calendar. 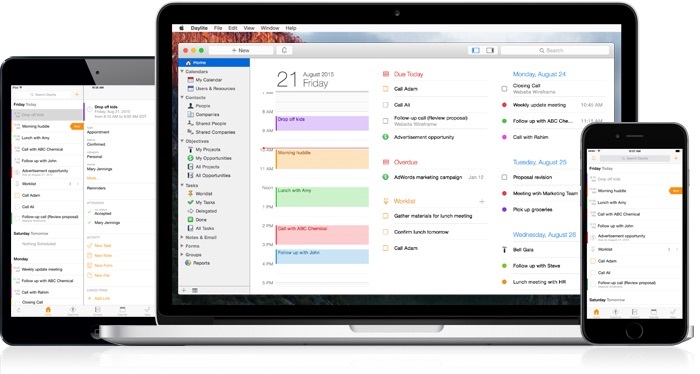 Daylite 6 also adds some features to make task management easier. 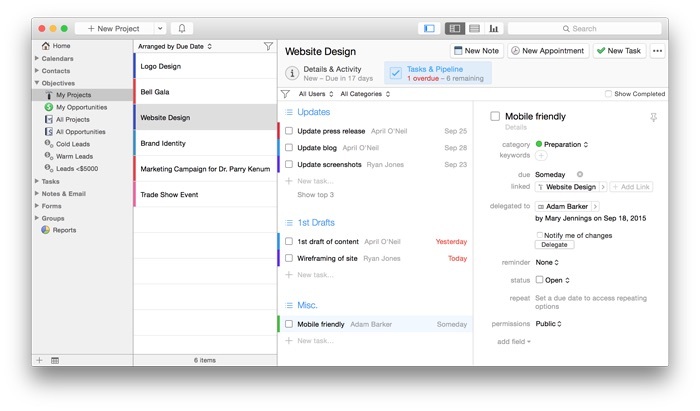 As the company notes, sometimes you may have a lot of tasks that aren't specific to a project or opportunity pipeline, so the app now has task lists where you can just drag, drop and sort those to-dos. Smart filtering has been added to tasks so it's easier to sort by team member, category or keyword, and the task editing process has been streamlined. While it's not a traditional Project Management application, I've often found Daylite to be superior to those tools in providing planning and tracking of projects and opportunities. The app now makes it easy to see how many days are left and how many tasks are remaining by looking at the tabs, with overdue tasks showing up in red to get your attention. The changes give Daylite 6 users much more information with just a glance. On iPhone and iPad, the app has been updated as well. There's a new Today widget so daily objectives appear on the lock screen, and a Worklist widget for checking those top priority tasks. The iOS apps have filtering enabled for faster task or contact searches, and file linking now lets you add photos or files to multiple items in Daylite. Other features include the ability to call using FaceTime, opening addresses in the Maps app, dismissing all notifications at once, and accepting or declining meeting invitations from the Appointment view. Probably the best thing is that pricing for the app and cloud service is simpler than before. The entire ball of wax on all platforms is just US$29/month, or $24/month if you pay for one year in advance. Should you decide that you still want to set up and run your own server, "self-serve" pricing is $299.95 per user.